A prominent House Republican has resigned after the revelation that he exchanged raunchy e-mails with a teenage boy, a former congressional page. 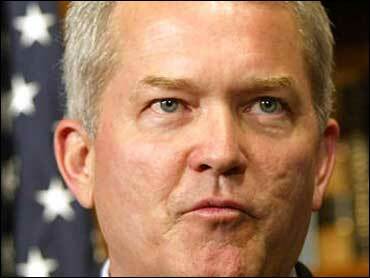 Rep. Mark Foley, of Florida, who is single, apologized Friday for letting down his family and constituents. Once his resignation letter was read to the House late Friday afternoon, Republicans spent the night trying to explain — six weeks before congressional elections — how this could have happened on their watch. Near midnight, they engineered a vote to let the House ethics committee decide whether an investigation is needed. The congressional sponsor of the page, Republican Rep. Rodney Alexander, said he was asked by the youth's parents not to pursue the matter, so he dropped it. Pages are high school students who attend classes under congressional supervision and work as messengers. Alexander said that before deciding to end his involvement, he passed on what he knew to the chairman of the House Republican campaign organization, Rep. Thomas Reynolds. Reynolds' spokesman, Carl Forti, said "We are not characterizing conversations that Congressman Reynolds may have had or may not have had with other members of Congress on that subject." . Republican Rep. John Shimkus, chairman of the Page Board that oversees the congressional work-study program for high schoolers, said he did investigate but Foley falsely assured him he was only mentoring the boy. The spokesman for Speaker Dennis Hastert, Ron Bonjean, said the top House Republican had not known about the allegations. Shimkus said he learned about them in late 2005. Just as Shimkus' explanation was released, House Democratic Leader Nancy Pelosi proposed to the House that its ethics committee investigate and make a preliminary report in 10 days. She demanded to know who knew of the messages, whether Foley had other contacts with pages and when the Republican leadership was notified of Foley's conduct. Instead, majority Republicans engineered a vote to allow the ethics panel to decide whether there should even be an investigation. Foley's departure sent Republicans scrambling for a replacement candidate. Foley, 52, had been a shoo-in for a new term until the e-mail correspondence surfaced in recent days. The page was 16 at the time of the correspondence. Beyond the scandal, there are serious political implications. Democrats need a net gain of 15 seats for control of the House of Representatives in November. It's too late for Republicans to put another candidate on the ballot and while there are theoretical scenarios involving a write-in Republican and special elections, Republicans tell CBS News they've probably lost the seat. Foley's Democratic challenger, Tim Mahoney, was 13 points behind in the polls last week. A wealthy businessman and cattle rancher, today he may be one of the luckiest politicians around, reports CBS News correspondent Sharyl Attkisson. Florida Republicans planned to meet as soon as Monday to name a replacement in Foley's district, which President George W. Bush won with 55 percent in 2004 and is now in play for November. Though Florida ballots have already been printed with Foley's name and cannot be changed, any votes for Foley will count toward the party's choice. Hastert said Friday he had asked Shimkus to investigate the page system. "We want to make sure that all our pages are safe and the page system is safe," Hastert said. ABC News reported Friday that Foley also engaged in a series of sexually explicit instant messages with current and former pages, all male. In one message, ABC said, Foley wrote to one page, "Do I make you a little horny?" In another message, Foley wrote, "You in your boxers, too? ... Well, strip down and get relaxed." "We track library books better than we do sexual predators," Foley has said. Foley, who represented an area around Palm Beach County, e-mailed the page in August 2005. Foley asked him how he was doing after Hurricane Katrina and what he wanted for his birthday. The congressman also asked the boy to send a photo of himself, according to excerpts of the e-mails that were originally released by ABC News. The e-mails were posted Friday on the Web site of Citizens for Responsibility and Ethics in Washington after ABC News reported their existence. Naomi Seligman, a spokeswoman for CREW, said the group also sent a letter to the FBI after it received the e-mails. CREW did not post their copies of the e-mail until ABC News reported them, instead waiting for the investigation. "The House of Representatives has an obligation to protect the teenagers who come to Congress to learn about the legislative process," the group wrote. According to the CREW posting, the boy e-mailed a colleague in Alexander's office about Foley's e-mails, saying, "This freaked me out." On the request for a photo, the boy repeated the word "sick" 13 times. He said Foley asked for his e-mail when the boy gave him a thank-you card. The boy also said Foley wrote that he had e-mailed another page. "he's such a nice guy," Foley wrote about the other boy. "acts much older than his age...and hes in really great shape...i am just finished riding my bike on a 25 mile journey now heading to the gym...whats school like for you this year?" In other e-mails, Foley wrote: "I am back in Florida now...its nice here...been raining today...it sounds like you will have some fun over the next few weeks...how old are you now?" and "how are you weathering the hurricane...are you safe...send me an email pic of you as well."